A digital audio recorder enables you to record your favourite music for offline listening, so that you need not visit the website again and again and stream the tracks. You can also extract audio files from other audios like TV, audio chats and videos easily with the help of the audio recording programs. This post will introduce the top 5 digital audio recorder reviews that help you to learn more about the audio recording programs. 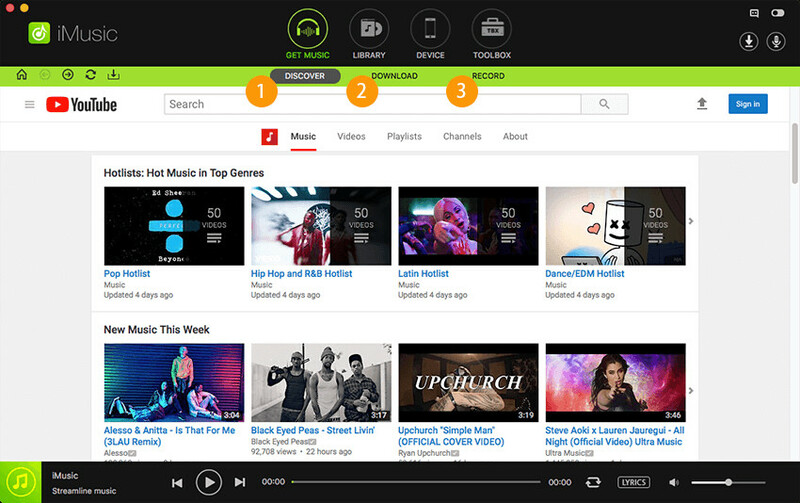 iMusic is a program which facilitates audio recording feature from an online source to computer for the offline enjoyment. This software also provides functions for the users to transfer the downloaded or recorded files to mobile devices so that the users can listen to the audio files on the go. The following section will introduce the key features of the program and how to use it. 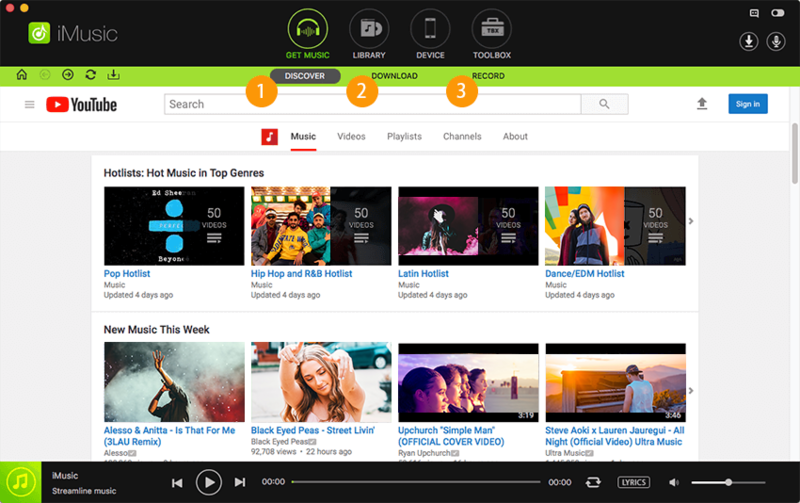 iMusic allows users to record audio files from more than 1000 music sharing sites. The program will transfer the downloaded or recorded audio files to mobile devices with a click. The program automatically fix the music tags during the recording process. iMusic will save the downloaded or recorded music files in MP3 files, which is supported by most OS and devices. iMusic will save the downloaded or recorded music files in its music library, so that the users can get access to them easily. 1. Awesome, fast, very intuitive and easy to use. After (unsuccessfully) trying to move selected audio from my Mac to Iphone for over 30min, i was literally crying with frustration about iTunes. Your product solved my issue in 30 seconds...Thanks!! 2. It works great, it made my life easier. Transferring my music from Ipad to Macbook Pro or vice versa has never been so easy. Thanks guys, you really know what you are doing. Step 2. Choose the RECORD option at the top middle of the software window, and then click the Record button at bottom to make the program stand by. After that, play the audio file you need, and the program will automatically reocrd it. Note: Please note that you should click the Record button before starting playing the audio file, so that the program can get the complete music info. Step 3. 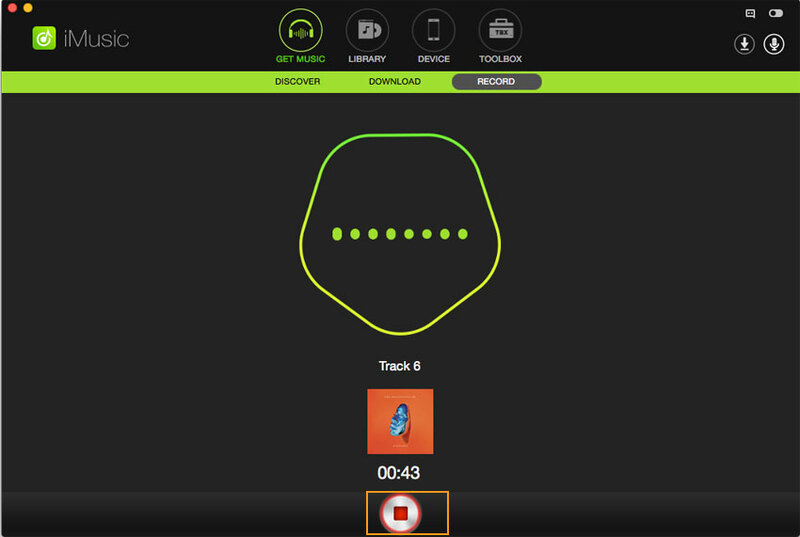 When the audio file finishes playing, you can click the Record button again to stop the recording process. Then you can click the microphone icon at the upper right corner to view the recorded music files. Wondershare Streaming Audio Recorder is a recording program which allows the user to record audio file from any possible source, online or offline, as soon as the file is playing. The key features of Wondershare Streaming Audio Recorder will be introduced below. 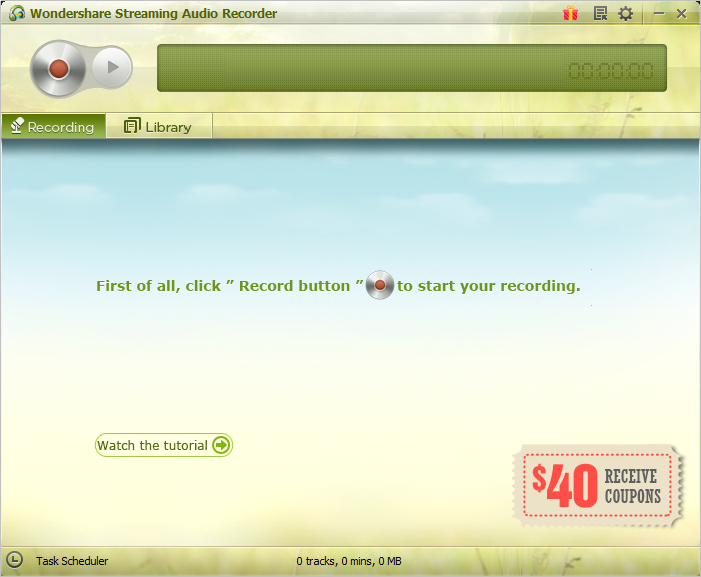 Wondershare Streaming Audio Recorder allows users to record music files from different resources. The program will block the pop-up ads during the recording process. Wondershare Streaming Audio Recorder has a Make Ringtone feature, which allows you to make ringtone from the recorded audio files. The program also enables users to record audio files from audio calls, voice messages and son on your computer. 1. Excellent program. I need to say no more. All of Wondershare's products are excellent. I tried many others & they don't come close to Wondershare. 2. Installed it a few hours back, and it worked perfectly right out of the box. It has just finished recording my first Spotify playlist, 4.7 hours, 74 tracks, every split went perfect, just three unrecognized tracks that was easily edited. A very solid product, and highly recommended, five out of five stars! 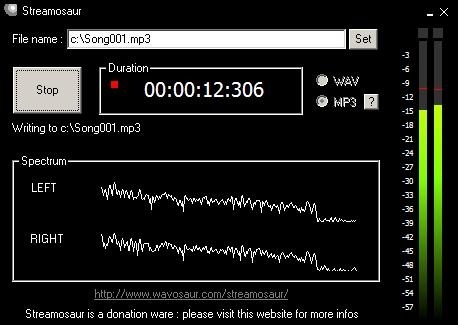 Streamosaur is a piece of software which allows the user to record and capture sounds from offline sources and online streaming sources. This program is also a great audio recorder, and the following part will introduce the key features of this program. This software is compatible with Windows Vista and XP and saves the recorded files in WAV and MP3 format. It is not at all complicated to use and has an attractive design andgraphically advanced interface. 1. It is portable. Copy it to thumb drive and take it along with you on the go. It shows left and right audio channel signal levels so you know if the audio input is loud enough and yet no clipping occurs. There are no options, except to choose whether to save as wav or mp3. Without the messy and dubious options which only an AV engineer understands, if you use other competitive products. 2. Streamosaur is an efficient piece of software which does not hinder the computer’s performance. The response time is good and the interface is friendly. Nonetheless, it is in dire need of an update, and it lacks some of the features other similar products encompass. Aktiv MP3 Recorder is a program which is available for free on the Internet. 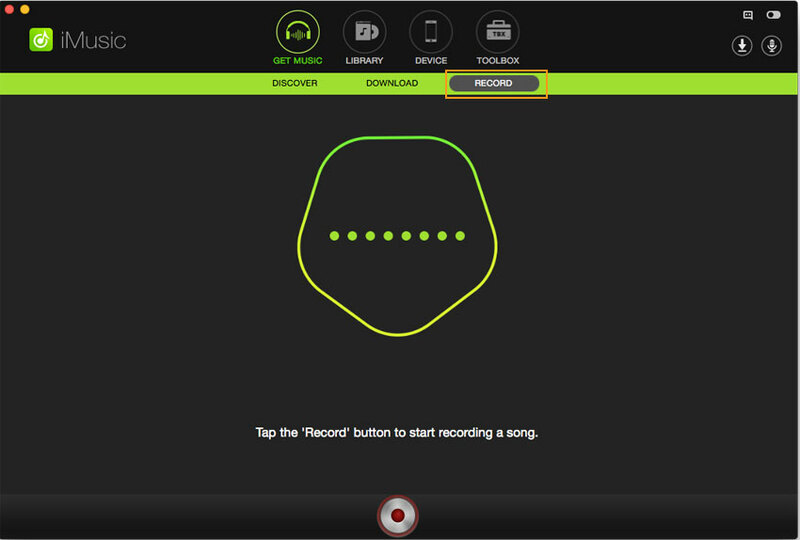 This program enables users to record audio files playing the computer, and it provides a stable recording process which makes it easier for the users to get the complete music files they want. The following section introduces the key features of the program. It can convert old tapes, CDs and DVDs to digital music files, and save them on your computer. The software is capable of recording any track which is played through the PC’s sound card and can save the files to preferred file formats. The formats available for conversion are Mp3, VMA, VOX, AU, AIFF, and OGG and the software allows the user to edit the tracks as well. 1. The user-friendly interface lets you perform numerous operations with audio data such among which displaying a waveform image of an audio file, filtering, working with different audio effects and an equalizer to increase the sound quality of all recordings. 2. Required file format conversions are executed automatically using smart caching to prevent duplicate conversions. Aktiv MP3 Recorder is an exceptional tool for protecting your valuable recordings: once you've configured the settings - the sound source, the recording quality, and volume, you can start recording. This program helps users to record audio files on your computer, and it makes the recording process easy to be done. The program also helps to download streaming music files, which is of great use to the users who want to get the audio files they need. The key features of this program will be introduced below. Stream Recorder can record audio from YouTube and Vimeo and also from offline sources. It has to be connected to .NET 3.5SP1 in order to function smoothly. You can also record your TV shows by scheduling them on this audio recorder. 1. If you're looking for a way to record your favorite live show online or want to schedule a recording in the future, then Stream Recorder.NET is the perfect free (and open source) tool which allows you to do that with little effort. 2. With Stream Recorder.NET, you can record VLC Media Player or MPlayer-compatible streams. The program also offers a scheduler however it isn't necessarily suitable for novice users due to its reliance on the command-line. Overall, a cool project which is compatible with the latest versions of Windows and probably suitable for recording video gaming.